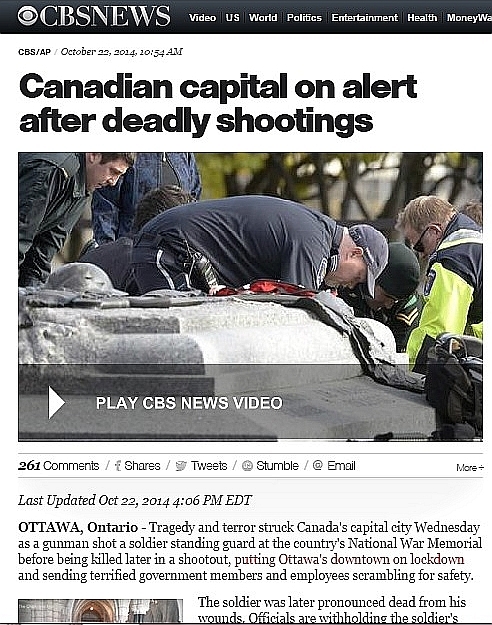 A terrible tragedy befell the nation’s capital yesterday, when a shooter opened fire at government sites in Ottawa. A full investigation must begin to assemble the details, as the flames of hysteria are fanned in the public consciousness. The words “terror” and “terrorism” have been tossed around so casually, that nowadays any hardened criminal would classify as a terrorist according to the Harper Government and mainstream news sources. For that matter, political activists who take issue with the government’s policies at home and abroad are referenced in the same manner. On the opposite end of the spectrum, social media is rife with suspicion that this horrendous event may represent a false flag operation, to assist the government’s dismantling of civil liberty and human rights in the name of war, profit, political posturing and public control. That’s not to say this wasn’t an act of terrorism. Maybe it was, but surely it’s too early to reach a conclusion when the names of suspects hadn’t been released to hypothesize a motive. Or had they? At 12:11pm EDT, The CBC’s Kady O’Malley reported her group was ordered to leave a local rooftop by police, as they continued to search for a culprit and attempted to secure the area. 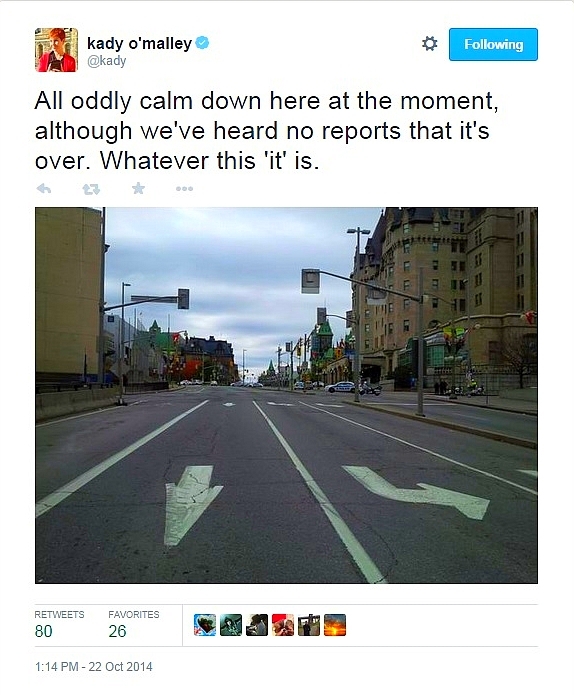 By 1:14pm EDT, Ms. O’Malley reported a continuing lockdown that blanketed Ottawa. She was unclear if the event was over, as no further information was available. While Canadian news personalities were at police gunpoint, American outlets like CBS News and the Associated Press had a full story to sell, complete with the dead shooter’s name. 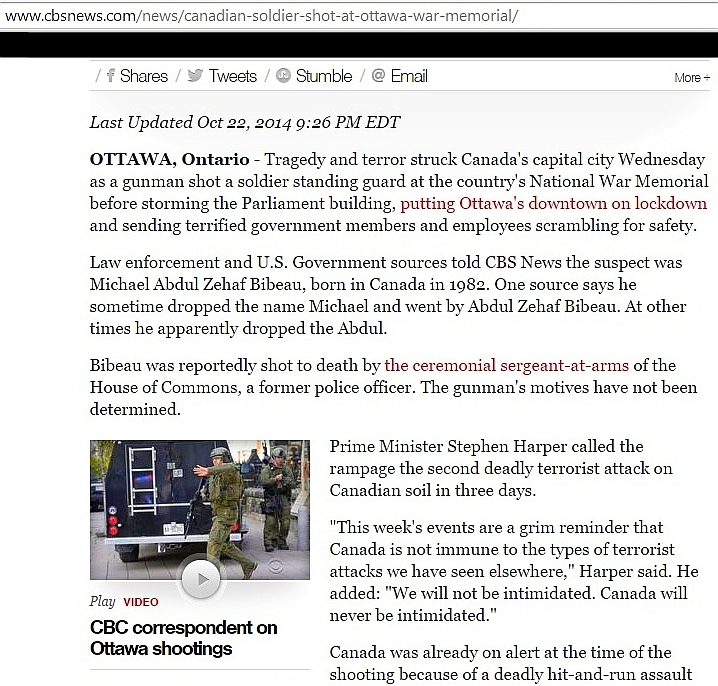 By 4:58pm EDT, the story was edited to remove the shooter’s name, or any mention of the U.S. government’s knowledge. The only problem is that no one could update the Google database quick enough with these changes, so the original information still appeared with search results. This story was altered again in the evening, when the Canadian government allowed the name of a shooter to be released and American media added law enforcement to their list of official sources. They also added a middle name, Abdul, to emphasize the suspect’s Islamic ties with an accusation of terrorism. As members of parliament begin to piece this tragedy together, they’re advised to inquire how American intelligence knew the name of a ‘possible terrorist’ as the mayhem was still unfolding. How did Americans know when Canadians didn’t, and how was the information so widespread that foreign media and Google had access to distribute, but domestic reporters on the scene did not. Canadian parliamentary bureau chiefs didn’t posses the same information as their U.S. counterparts and they faced the barrel of police guns as a narrative was provided on their behalf by another country. If this is dubbed an act of terrorism that American sources had knowledge to pre-report, then why weren’t steps taken to prevent the violence? Many have questioned how a gunman could enter parliament with a rifle unnoticed, despite the massive security and busy lineups. Some are calling for greater state police control and warmed to relinquishing their Charter rights, in an effort to fight the new war on domestic terrorism. Something has to justify police militarization since the War on Drugs has been transformed into a lucrative product of capitalism. All Canadians who pay attention to the news are acutely aware of a creeping police state and the loss of privacy rights in the tradeoff. In fact, one Liberal MP, Joyce Murray, proposed Bill C-622 to gain oversight of CSIS and CSEC, so law enforcement can’t overstep its bounds to the degree that’s been revealed through Snowden leaks. This shooting event also occurs at a time when the Mayor of Ottawa is seeking re-election, with a history of accommodating CSEC as a business partner. The journalist who brought these Snowden leaks to light is in town to promote his new book about the overreaching powers of a surveillance state. Glenn Greenwald will be speaking just a few blocks from Parliament Hill, in the same neighbourhood that’s under lockdown. It’s purely coincidental that he wrote a scathing piece about the Canadian government and co-dependent media’s abuse of the word “terrorism” a day earlier. 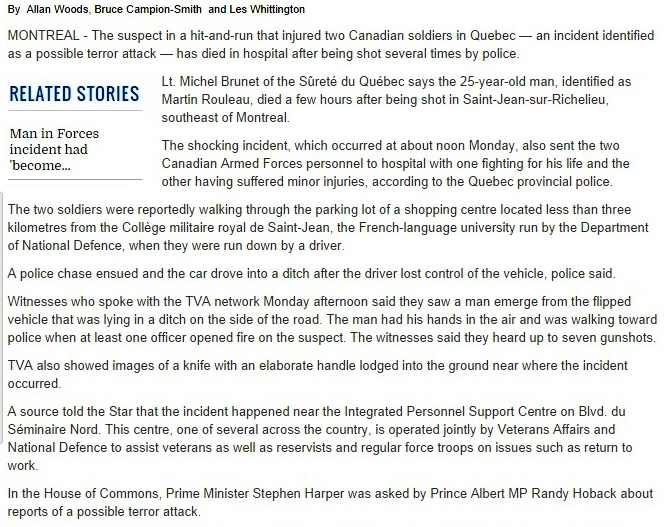 Meanwhile, the NDP noticed a different terrorism anomaly regarding the violence in Quebec on the day before as well. The Prime Minister’s Office was accused of planting a foreboding comment in Question Period, that preempted police reports of a “possible terror attack against soldiers”. Public Safety Minster Steve Blaney reported the Monday event was “clearly linked to terrorist ideology”, but the Toronto Star reported multiple witnesses saw the suspect with his hands in the air, when at least one police officer opened fire. They also say a knife was “lodged into the ground near where the incident occurred”. Well, that’s what the original story by Allan Woods, Bruce Campion-Smith, Joanna Smith, Tonda MacCharles and Les Whittington stated. A syndicated copy had to be located at the Cambridge Times, because a newer, edited version at the Toronto Star appeared dramatically altered by Tuesday. Forsaking journalism ethics, the Toronto Star surprised industry watchers by editing this story without providing a notice to reflect the consequential changes. Now the article claims the suspect was an Islamic radical, who emerged from the vehicle with a knife in his hands. There is no mention of any witnesses who saw his hands in the air and the knife was no longer lodged in the ground. All information from witnesses was removed without explanation, or apology for reporting incorrectly at the onset, if indeed the witnesses were mistaken. The French press at TVA still values the eye witness accounts, but no English speaking media reflects these reports from the scene. This TorStar article was more than edited and qualifies as being replaced entirely, having lost its tone, facts and spirit from the original published version. It was radically changed to support the government’s narrative and censored independent sources that previously appeared, replacing them with quotes from the Harper administration that focus on the suspect’s motive for Islamic terrorism. If it wasn’t for smaller newspapers syndicating the Toronto Star‘s original content, there would be no proof of the first comprehensive version. Professional journalists don’t normally condone editors changing the spirit of their work without a caveat, especially when five reporters collaborated to produce the same entry. The history created by print newspapers also couldn’t be erased with the click of a button, before the press migrated to internet-based reporting that appears to lack mechanisms of accountability. These two examples oppose each other due to the disparity between facts and there is no footnote to reflect this glaring incongruency. The Toronto Star has been a leader in journalism ethics and wouldn’t alter published pieces to discredit their own reporting without a reason being provided. That is, until they and a bevy of established journalists who remained silent, had a taste of the politics of fear. Any reasonable person should be afraid when gunshots are flying from hostile individuals, but will fear be allowed to dictate a terrorism narrative in place of the facts? The Opposition’s privacy and ethics critic, MP Charlie Angus, also describes gunshots around 10am EDT, while American media had solved the event by 10:54am EDT and members of parliament were being detained without access to the same information. If the U.S government could assess a terrorist attack on Canadian soil before the Canadian government was aware, then why was it not prevented? On the same token, if the Canadian government was in the middle of mayhem, then how did Americans obtain information that wasn’t available to affected bureaucrats, from their own intelligence and law enforcement agencies? What powers does America have over Canada that Canada doesn’t have itself? If a shooting on government property can be solved before it’s even finished, then why wasn’t CSIS, CSEC, DHS and the NSA capable of early intervention? After all, the Wednesday shooter was already placed on the government’s watch-list. The timing is incredible and may very well be motivated by the war against ISIS/ISIL. Canada shed its peacekeeping status for more aggressive combat that generates profits for the Canada Pension Plan, with the potential to invite ideological backlash. This is not disputed. An unbiased investigation is required, but the public should be patient for confirmed, judicial facts; bearing in mind political motives, various narratives and the race to sell fear. On the very day terrorism was alleged in Quebec, the Harper Government passed Bill C-13 without much notice from the peanut gallery. Until Monday, Bill C-13 was one of the most controversial pieces of legislation that was presented under the guise of cyber-bullying, but even the mother of Amanda Todd spoke against the exploitation of her daughter’s death as a tool to create a warrantless surveillance state in this vein. Due to terrorism accusations made by the Harper Government that took up most of the day, no mainstream news reported the bill’s passage later in the same day. CBC was the only major outlet to mention the bill on Monday, but they neglected to note the House of Commons vote or passage of this legislation at any point in the story. They presented the information as incremental progress while failing to report its successful, parliamentary completion. This too presents a problem with ethical journalism, but CBC has seen its fair share of challenges since the Harper Government appointed ten Conservative donors to the board of directors, with influence over the public broadcaster’s direction. Regardless, the only mention of Bill C-13 passing arises from a Saanich News editorial. The smaller publication urges everyone to be vigilant as this legislation completes the last step of approval (ascent) with senate, that is dominated by a Conservative majority. Surprisingly, the senate passed a first reading of Bill C-13 the very next day. It accomplished that hurdle expediently on Tuesday, but this wasn’t reported by any source whatsoever. Senators then scheduled a second reading in two days’ time, on Thursday, October 23, 2014. The only lapse in this process was the Wednesday parliamentary shooting. By today Bill C-13 may see the quickest passage through any bureaucracy in the democratic world, without the public or media noticing and while legislators are reeling from the ominous smell of gun smoke. Neither the parliamentary reporters who stared down the barrel of a police gun on Tuesday, nor the members of parliament who were barricaded, would be rested very well. Plus there’s an RCMP press conference about the Wednesday shooting that will surely distract attention from the new law. In the days ahead, it’s likely they’ll tout Bill C-13 as a way to catch terrorists, also under the guise of cyberbulling and even though being watch-listed with preexisting surveillance powers didn’t prevent Michael Zehaf-Bibeau from taking action. This brings us to what’s at stake. The taboo that nobody wants to evaluate. The decision senators will have to make while recovering from a psychologically traumatic breach of personal security. We’re talking about public data surveillance, or what closely resembles stalking. There are plenty of ambiguous words used to describe big data monitoring, but few understand what it means or how deeply it’s abused behind the sealed doors at CSEC. Warrantless internet surveillance has the potential to track a target’s GPS movements with updating by the minute. It can penetrate the entire chain of communication between an individual and their contacts, including strangers who make reference to the target by any degree of separation across the world wide web. The technology has predictive behaviour capabilities. Every citizen caught in this widespread dragnet is psychologically assessed through language semantics and assigned a persuasion, to determine if any of them presents a public relations issue, or if the original target has too much influence to garner support for their business, political and/or social beliefs. Five Eyes governments have established media surveillance programs specifically. They surveil news topics and journalists, to monitor the reporter’s effect on public perception. When anyone posts a news link on any form of social media, all comments are collected and ranked for government and law enforcement dissemination. Canada spent $20 million and hired 3,300 staff to spy on journalists and political opponents since 2012. The European Commission and United States does the same, in this vacuum of nonexistent legislation to protect the public’s privacy in the modern age. Instead of updating constitutional rights to reflect modern technology, they’ve crafted legislation like Bill C-13 that revokes those rights entirely. This goes beyond the confines of metadata and only the Privacy Commissioner of Ontario has taken up the cause, likely to the chagrin of political parties that have begun to use similar technology against their opponents during elections. Whatever good this intrusive spying could accomplish is outweighed by the bad. Michael Sona only possessed a list of phone numbers and intentions, let alone mapping of the entire public’s thoughts and updates on the location of political foes by the minute. If anyone physically tailed a political candidate, volunteer or supporter every minute of the day and night, or attempted to record every one of their exchanges, it would be considered criminal harassment. If that person also tailed every contact who spoke about their target and psychologically assessed them to create charts, it would surpass Hollywood’s fascination with the complex plotting of serial offenders. But this isn’t fiction and warrantless internet surveillance can be used to harm a civilian, based on their political beliefs. In the United States it’s already used to surveil judges, adding a difficult challenge to the essence and appearance of democracy. The dialogue is strictly controlled to conceal these uses and they’re couched in the terrorist argument, to discourage the public from searching deeper. Residents have been told if they don’t break the law, there is nothing to fear. This subverts any purpose of the Canadian Charter of Rights and Freedoms and replaces that document with a Trust Me clause from the government. It replaces the core legal relationship between citizens and law enforcement, with unrestrained power and no oversight to justify its use. It imperils evidentiary laws that are designed to protect the innocent. Beyond the dry language of legislation, this is how the words of Bill C-13 can be utilized by an aggressive government and the Five Eyes intelligence community. Suggested reading provides the history and development of technology and related policies in Canada, the United States and Europe. It was becoming law in Canada when the airwaves were filled with terrorism accusations and the government expected no one would notice. It also relates to media surveillance that could explain a few altered stories, deleted posts and political misunderstanding. 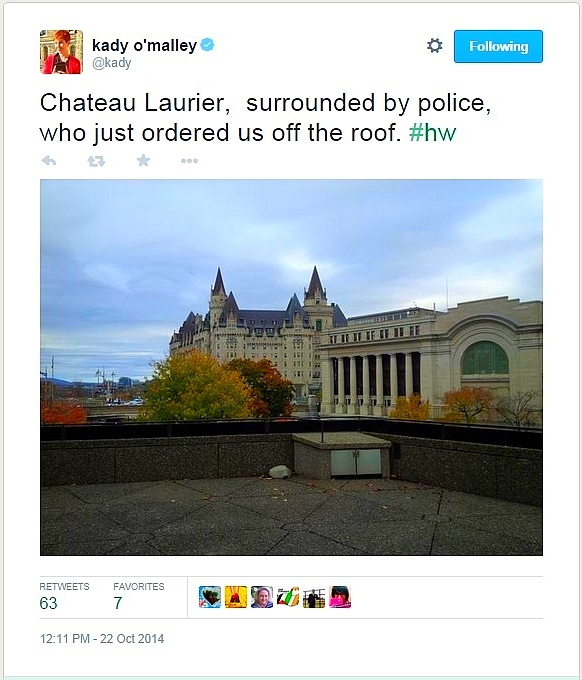 Edit, November 22, 2014: Liberal Senator Céline Hervieux-Payette published a diary of events during the Ottawa shooting, while barricaded in an office with numerous colleagues. Her honest and forthright account also challenges the Harper government and American explanations. The timed entries conflict with media reports, as documented above. She further includes mention of a second shooter.